How I protect my Superannuation against large falls in the share market. Legal Disclaimer: I do not hold a Financial Advisor’s Licence and nothing in this article should be considered as recommending any particular course of action to anyone else. As of 11th February, I have move all of my super from AustralianSuper to Hostplus. The chart below shows why. The chart is back testing ProtectYourSuper on Hostplus versus AustralianSuper from 9th November 2017 to 17th January 2019. Hostplus only started publishing daily unit prices from 9th November 2017. The red line AustralianSuper's results and the blue line is Hostplus' results for ProtectYourSuper. When the yellow line is up, ProtectYourSuper is in 100% Australian Shares. When the yellow line is down, ProtectYourSuper is in Property. In Hostplus that is 100% Property, but AustralianSuper limits Property investments to 70% of your balance so the AustralianSuper result is for 70% Property / 30% Cash fund. The Hostplus result is noticeable better. This is due to i) a much better return for the Hostplus Property Fund (versus AustralianSuper's Property Fund) and ii) Hostplus not limiting investment in its Property Fund. Even if Hostplus and AustralianSuper has similar returns for their Property Funds, Hostplus would still be preferred since it allows 100% to be invested in Property. See the Previous Commentaries for more info on the recent changes to AustralianSuper Property fund conditions. The rest of this page still talks about AustralianSuper results as there are none yet for Hostplus. This will be updated next quarter. There are only three (3) AustralianSuper finds that don't involve shares. Those are Property, Diversified Fixed Interest and the Cash fund. Previously ProtectYourSuper has used Property as the 'cash' alternative when not in 100% shares. From Monday 19 November 2018 there is a cap on how much you can invest in the Property option and AustralianSuper has the discretion to freeze switches, contributions and withdrawals into and out of the Property option for a maximum of up to two years. A freeze will only be applied when we feel it is in the best interests of members and we will notify you as soon as possible after it has been imposed. Read that page carefully for the details. That makes the Property Fund a bit more risky, since it may be frozen for up to 2 years. However it has been returning significantly higher returns over the last few year compared to the Diversified Fix Interest or the Cash Fund. So I have choosen to keep using Property as a 'cash' alternative. 70% is the maximum AustraliaSuper allows for Property, so when ProtectYourSuper in not in 100% Australian Shares it will be in 70% Property and 30% Cash. AustralianSuper has re-opened the Property Fund for investment (up to 70% only), however in the mean time the Australian Share market has dropped 10% and has not yet recovered. When stock market corrections like this are under way, I get nervous and would prefer to have all my super in the Cash Fund. So for the moment I am leaving all my super in the AustralianSuper Cash Fund. This means I can put off answering the above two questions for now. Since I cannot for see how the Property Fund price might change due to this forced dis-investment, I have moved from 100% Property to 100% Cash until at least 19th Nov 2018 when AustralianSuper completes the changes. a) Since at least 30% of the Property, the Cash Alternative for ProtectYourSuper, has to be moved to another Fund, what Fund should that be? b) Having answered a), what %, if any, should be left in Property given it may be frozen for up to 2 years. Having been 100% Shares for the last few months, ProtectYourSuper recently switched back to its 'cash' alternative, i.e. AustralianSuper Property. This switch into and out of shares resulted in a small loss so Rule 3 is now false and ProtectYourSuper will stay out of Shares until there has been a profitable 'paper' switch into and out of Shares. The charts and yearly returns have been updated to end of financial year 2018. ProtectYourSuper is currently 100% Shares. The charts have been updated to 16th April 2018. Not much change since the last update 3 months ago. Rule 3 is true and ProtectYourSuper will switch to shares the next time share market turns up. That is when the 11 day moving average is higher then the 33 day moving average AND the 33 day moving average crosses above the 99 day moving average. Until that happens ProtectYourSuper is still in Property (its 'cash' alternative). The charts have been updated to 10th Feb 2018. For the first time in over 12 months the last paper (pretend) switch into and out of shares was profitable. So rule 3 is now true and ProtectYourSuper will switch to shares the next time share market turns up. That is when the 11 day moving average is higher then the 33 day moving average AND the 33 day moving average crosses above the 99 day moving average. Until that happens ProtectYourSuper is still in Property (its 'cash' alternative). The charts have been updated for the first quarter of 2017-18 financial year. Nothing much happening in the last 12 months. ProtectYourSuper is still in Property (its 'cash' alternative) waiting for a profitable switch into and out of shares so that Rule 3 becomes true. Results for last financial year (2016-17) are given below. ProtectYourSuper continues to provide similar returns, over the last 9 years, as the Australian Super Shares and Australian Super Balanced funds but ProtectYourSuper has a much lower variation in return from year to year and so far has never had a negative return (lost money). Nothing much happened in the last 9 months. ProtectYourSuper is still in Property (its 'cash' alternative) waiting for a profitable switch into and out of shares so that Rule 3 becomes true. Results for last financial year are given below. ProtectYourSuper continues to provide similar returns, over the last 9 years, as the Australian Super Shares and Australian Super Balanced funds but ProtectYourSuper has a much lower variation in return from year to year and so far has never had a negative return (lost money). Nothing much happened in the last 6 months. ProtectYourSuper is still in Property (its 'cash' alternative) waiting for a profitable switch into and out of shares so that Rule 3 becomes true. As noted in the last commentary, the rule 3 was true and so when the market turned up, ProtectYourSuper switched into shares between 18th July and 2nd Sept 2016. Unfortunately that switch lost money, based on the All Ordinary share prices, so rule 3 is now false again and ProtectYourSuper will stay out of shares until there is a successful paper trade which makes rule 3 true again. Actually the last switch made money based on the AustralianSuper fund prices, but this was just lucky (or perhaps good management on the part of AustralianSuper). This update has the end of financial year results. For almost all of the last financial year ProtectYourSuper has been in AustralianSuper Property, except between 26th August 2015 to 12th October 2105 when I switched to Cash, for complete safety, as the share market collapsed. Last financial year the return for ProtectYourSuper was twice that of either AustralianSuper Shares or Balanced funds. The last 'paper' switch into shares using just rules 1 and 2 resulted in a profit (rule 3 is now true), so the next time the share market rises sufficiently to satisfy rules 1 and 2 (short term and long term moving averages going up), ProtectYourSuper will switch into 100% Shares. As at 2th April 2016, ProtectYourSuper is still in the AustralianSuper Property 'cash' alternative. The last time ProtectYourSuper was in shares was 4th May 2015. The AustralianSuper chart below shows the relative performance of Property versus Balanced and Shares since 4th May 2015. As indicated on the chart, I switched from the Property to the Cash fund, from 26th August 2015 to 12th October 2105. In a share market crash, none of the 'cash' alternatives are as safe as pure CASH. If the Share market continues to move higher then rules 1 and 2 will become true this weekend. However since the last switch to Shares did not make a profit, ProtectYourSuper will not be switching to shares this time but will just wait and see what happens. In the mean time the AustralianSuper Propery fund, which is my current 'cash' alternative, continues to be on track to provide about 8% return for the year, based on last years results and the first 6 months of this financial year. Since ProtectYourSuper switched out of 100% Australian Shares on the 1st May 2015, the All Ordinaries has dropped 13% and has currently recovered to be 5.3% down from 1st May but still 7.5% down from its recent peak. On the 26th August I switched from the AustralianSuper Property 'cash' alternative to Australian Superannuation Cash fund as a precaution. However AustralianSuper Property appears to have weathered the market volatility, so on the 12th October 2015, I switch back to 100% AustralianSuper Property as my 'cash' alternative. ProtectYourSuper is unlikely to switch to Shares in the foreseeable future. The stock market will have to mount a sustained recovery, then a pull back and then continue upward before ProtectYourSuper will risk going into shares again. In the mean time the AustralianSuper Propery fund appears on track to provide about 8% return for the year, based on last years results and this last quarters result. I continue to sleep soundly at night. Since ProtectYourSuper switched out of 100% Australian Shares on the 1st May 2015, the All Ordinaries has dropped 13%. I have avoided this loss using one of the 'cash' alternatives, however given the dramatic falls in the last few days, I have moved to 100% AustralianSuper Cash fund. This fund gives very low but very stable returns. Once the share market shows signs of a steady recovery, I will consider switching back to one of the other 'cash' alternatives, like AustralianSuper Property, Fixed Interest, Diversified Fixed Interest, but in the mean time I will sleep soundly at night. Australian Shares have recovered in the last three (3) years but their volatility has mostly kept ProtectYourSuper out of shares. This combined with the very low cash rates has impacted ProtectYourSuper's relative performance. Using a 'cash' alternative, like AustralianSuper Property, helps but not enough to keep up with a 100% shares fund. It is tempting to abandon the ProtectYourSuper method and just trust to a Balanced or 100% Share fund. However the gyrations of the Chinese market, the advance notice given by the US FED of a raise in US interest rates and the recent drops in the Australian Share market makes me nervous enough to continue with the more stable, if lower, returns offered by ProtectYourSuper. You may note that ProtectYourSuper quickly switched out of Australian Shares, on the 1st May 2015, as the Australian share market started to drop. For the last quarter, the Australian share market has been very volatile. Moving averages, which ProtectYourSuper uses, do not perform well in this type of market. So not surprisingly ProtectYourSuper has been in “cash” most of the time since December 2013. ProtectYourSuper will continue to stay mainly in “cash” until the market state changes to one in which moving averages start being profitable again. Currently ProtectYourSuper is about 19% below the AustralianSuper Australian Share fund since 2008, and about 15% below the AustralianSuper Balanced fund over this period. Also the very low Cash rate means that the ProtectYourSuper (Cash/Shares) is slow to recover from its drops. Other alternatives to “cash” such as AustralianSuper Property Fund and AustralianSuper Fixed Interest fund are doing much better, but are not as safe as pure cash, so I continue to plot the most conservative and safest option of AustralianSuper Cash fund. However you may like to consider one of these alternatives in the short term for a better return. Have updated the charts and performance results for last financial year. Also added a share dividend component to the historical plots. As you can see from the chart below since Nov 2013 the Australian share market has been very volatile with sharp rises and falls. Moving averages, which ProtectYourSuper uses, do not perform well in this type of market. So not surprisingly ProtectYourSuper has been in “Cash” most of the time since December 2013. ProtectYourSuper will continue to stay mainly in “Cash” until the market state changes to one in which moving averages start being profitable again. Currently ProtectYourSuper is about 10% below the AustralianSuper Australian Share fund since 2008, and about 6.3% below the AustralianSuper Balanced fund over this period. However the plot also shows that ProtectYourSuper has succeeded in avoiding the 20% and 30% drops the AustralianSuper Australian Share fund has experienced since July 2008 and so continues to for fill its aim of ProtectingYourSuper. In the charts below the “Cash” fund is the Australian Super Cash fund. There are other alternatives that could be used such as the Property Fund or the Australian Fixed Interest fund. These often have a better return then the Australian Super Cash fund, but not always, and are a riskier alternative. As I mentioned in the last commentary, the results and charts here are for the most conservative and safest option of the Australian Super Cash fund. As you can see from the chart below since Nov 2013 the Australian share market has been very volatile with sharp rises and falls. Moving averages, which ProtectYourSuper uses, do not perform well in this type of market. So not surprisingly ProtectYourSuper has been in “Cash” since December 2013. ProtectYourSuper will continue to stay in “Cash” until the market state changes to one in which moving averages start being profitable again. Currently ProtectYourSuper is about 5% below he AustralianSuper Australian Share fund since 2008, and slightly ahead of the AustralianSuper Balanced fund over this period. However the plot also shows that ProtectYourSuper has succeeded in avoiding the 20% and 30% drops the AustralianSuper Australian Share fund has experienced since July 2008 and so continues to for fill its aim of ProtectingYourSuper. As mentioned previously I have moved my “Cash” choice back to Australian Super Cash fund. 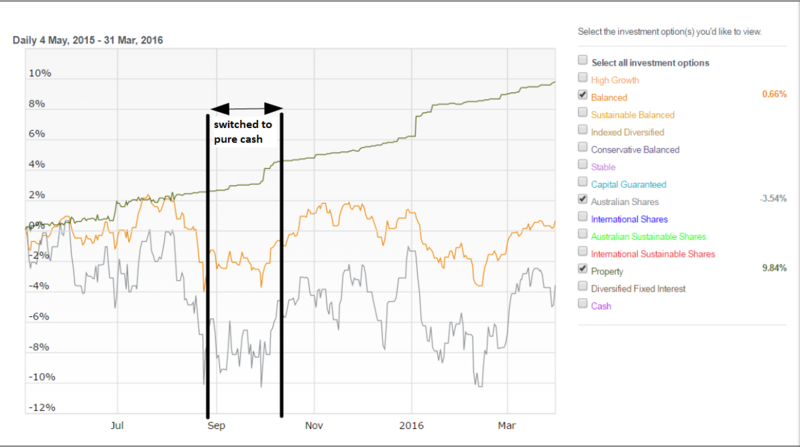 Rather than try and track and plot the different results when “Cash” is DiversifiedFixedInterest versus Cash, I have decided to take the more conservative and more pessimistic approach and just record the result for switching between 100% Australian Shares and 100% Cash fund. This causes results to be revised down but removes any backward (hindsight) bias and so gives a more accurate picture of the results. As the plot now shows this Shares/Cash ProtectYourSuper is currently about 4% below the AustralianSuper Australian Share fund but slightly above the AustralianSuper Balanced fund as measured from July 2008. However the plot also shows that ProtectYourSuper has succeeded in avoiding the 20% and 30% drops the AustralianSuper Australian Share fund has experienced since July 2008 and so continues to for fill its aim of ProtectingYourSuper. DiversifiedFixedInterest has dropped below the Cash line yesterday (15th August 2013) and AustralianFixedInterest has fallen also towards the end of last year and a little more recently, so I have switched my super to 100% Cash. My reason for this is that if interest rates rise then the returns from these funds would be expected to fall. So for the moment I am staying in pure CASH. I might change my mind later. ProtectYourSuper is about switching between 100% “Cash” and 100% Shares. Just what fund is used for the “Cash” part is a personal choice. I have updated charts for this end of financial year. There are lots of headlines about the 21.6% increase in Shares this year. So why did ProtectYourSuper not do better? The first point to realize is that AustralianSuper Share fund lost 4.6% the previous year, so over the two years combine the increase is reduced to 17%. ProtectYourSuper, switching between Shares and Diversified Australian Fixed Interest, would have returned 14.9% over the last two years. That is only about 2% less than the AustralianSuper AustralianShare fund. However unlike the Share fund, ProtectYourSuper did not have a loss in either year. One of the aims of ProtectYourSuper is to protect against losses so the each year you can expect to still have more then 90% of your capital (based on the last 13 years of data). That being said, I still investigated if a change to the ProtectYourSuper was warranted. The reason ProtectYourSuper did not participate in the shares rise last financial year was because, following Rule 3, the previous possible switch to shares did not return more then the 5% 'cash' rate. That is the return for the risk of being is shares did not out way the safety of 'cash' and so Rule 3 was not satisfied. An obvious change would be to reduce the cash rate so that Rule 3 was satisfied and ProtectYourSuper would switch into shares in the first half of 2013. It turns out to get this to happen the 'cash' rate has to be reduced to ~0%. Using the 'cash' rate of 0%, ProtectYourSuper would have switched into shares from May to June and would have returned 11% for the year and 17.9% for the two years. However the 3% gain over two years came at a cost. The capital dropped 7.5% in May 2012 as well as dropping 7% in June 2012. Overall reducing the 'cash' rate to 0% results only a 2.6% increase from 2008 to 2013 at the expense of additional significant drops in capital. So I am leaving the 'cash' rate at 5% and am happy to miss some the share rises confident that once the share market starts its next 'bull' run, ProtectYourSuper will take part, in the mean time ProtectYourSuper will continue to be cautious about switching into shares. I have updated charts for this quarter end and updated Protecting Your Super in Sideways Market. ProtectYourSuper is still in 'Cash' (AustralianSuper Diversified Fixed Interest) but using just the moving averages, there has been a profitable 'paper trade' switch into and out of shares. So rule 3 is now satisfied and so the next time the moving averages turn up, ProtectYourSuper will indicate a switch to Shares. I have updated charts for this quarter end and updated Protecting Your Super in Sideways Market. ProtectYourSuper is still in 'Cash' (AustralianSuper Diversified Fixed Interest) in will remain there until it proves it can make money by switching to shares and back again. I have made a few changes to the ProtectYourSuper user interface for V2.1.5 :- The results are now colour coded, green for switch to shares, red for switch to cash and black for no change since the previous week. There is extra checking for missing share data on Saturday mornings and a trading calendar has been added to handle Friday holidays. I have made to changes to how ProtectYourSuper determines Rule3. Rule 3 is what make ProtectYourSuper different from all other moving average systems. Rule 3 says, “If using the moving averages did not make a profit last time, don't use them this time.” The changes in V2.1.4 are to how the “profit” is calculated. The changes are i) use Monday's closing share index (instead of Tuesday's). AustralianSuper uses Monday closing fund prices when switching so this change more closely aligns the result to the real life AustralianSuper results. ii) In order for a switch to shares to have made a “profit” the increase must exceed the “cash” rate (i.e. 5%). That is in order to be counted as a profitable switch to shares, shares must return more than would have been received just leaving the super in “cash”. Switching to shares is risky so the reward must at lease exceed the 'safe' cash return. These two changes produced a noticable improvement in results. As previously advised, my 'cash' fund is currently AustralianSuper's Diversified Fixed Interest fund. Updated charts to show results for this quarter. See ProtectYourSuper in a Sideways Market for a discussion on why I am still in Cash. After reviewing the performance of AustralianSuper's Diversified Fixed Interest Fund versus AustralianSuper's Fixed Interest Fund, I have decided to switch to Diversified Fixed Interest Fund for my “100% cash” fund. The Diversified Fixed Interest has not always been a better choice but it has out performed over the last 18 months. I will review this choice on a regular basis. I have updated this page with the end of financial year results compared to AustralianSuper Funds. Yahoo finance is publishing share data with errors. The Friday date is repeated with a different close price and no volume. I have updated ProtectYourSuper to handle this data error. It appears AustralianSuper uses the Monday's closing fund values when switching. Previously I calculated the AustralianSuper performance based on using Tuesday's values. I have updated the AustralianSuper performance chart below to use Monday's values. The switching program I use is unchanged and still calculates profit based on the ALL Ords Tuesday closing index. I may review that later but for now the results are good enough. So the end result is that I have just made the AustralianSuper performance chart more accurate. I have updated the application program. No change to the results, but the application now checks if an update is available each time it runs. I have changed the AustralianSuper Fund that I use for my '100% Cash' option. I now use the AustralianSuper Australian Fixed Interest Fund. This fund appears, on the limited data available, to go up as the share market goes down and go down as the share market goes up. Overall, since 2008, using the moving averages SMA11 and SMA33, the Fix Interest Fund gives better results than the AustralianSuper Cash Fund. I have made a revised program available which downloads the share index data and does the calculations for the three rules used in this method and advise on when to switch. The program runs on Windows, Mac, Linux and Solaris. Installation and running documentation in pdf format is also available. This program also assists you if you want to start using the method by suggesting when to start switching. This version of the program (V2.1.0) produces the similar results as earlier versions but fixes some log messages and shuts down cleanly when the window is closed. V2.1.0 uses 11/33 as the two moving averages instead of 15/30 of V2.0. 11/33 gives better results based on past data.